A wide extended range of direct, disperse, cationic, reactive and acid dyestuffs which allow to satisfy the higher demands on cotton, polyester, acrylic fibers, wool and polyamide dyeing. We also offer the auxiliary products range named HISPANOL: Detergents, dispersants, wetting out agents, sizing agents, lubricants, softeners, fixing agents and defoaming agents. HT: Dyes of big molecule with high sublimation fastness for continuous dyeing, yarn, printing etc., as well as for exhaustion of mid and dark shades on PES and PES/cellulose. HTC: Dyes of mid molecule for dyeing by exhaustion of light shades low temperatures (for example PES/wool). ECO: Disperse dyes of large molecule that meets with the necessary requirements to be complied with products used in textile articles which are going to be certified. HISPALON: Acid dyes for polyamide with excellent covering and smooth dyeing. 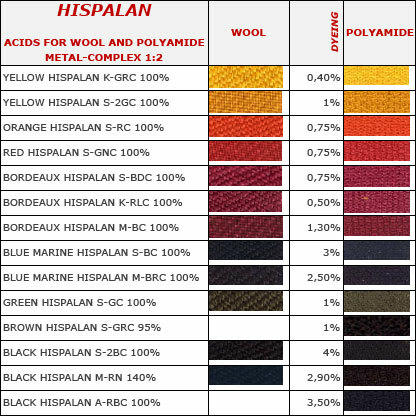 HISPALAN: Acid metal complex dyes for wool and polyamide. They have very good light and wetting fastness. Appropriate for carpet printing.